Conor Oberst, an Omaha, Nebraska, native and indie-scene developer, is known for being a lyricist and a storyteller. This reputation precedes him on his latest albums, “Ruminations” and “Salutations,” an acoustic demo and more finished product, respectively. The albums’ stories range from what one can only guess to be creative fiction to heartbreaking personal realities. Oberst tackles subjects like adultery, poor health, betrayal and his own celebrity. For the past year, Oberst has been performing these odes of both outside narratives and firsthand struggles on tour, from Sydney to Oxford. 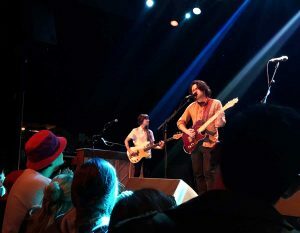 Tuesday night, Oberst took to the The Lyric Oxford stage with backup band The Felice Brothers and opener Tim Kasher. Past the merchandise table and usual black curtain separating the lobby, Tuesday’s crowd didn’t form the usual sardine can within the theatre. An initial scattered 30 concertgoers grew to about 100, making their way to the front with every song. Kasher, the frontman of the band Cursive and a dear friend of Oberst, opened up the show with nothing but his guitar and a sense of humor, occasionally interrupting his own singing to ask questions or comment on the South. “Tried to go out with a friend around 12:45 last night, and this place was a total ghost town,” Kasher said, not sounding too horribly disappointed. After about 45 minutes in the spotlight, Kasher relieved his voice from intermittently yet impressively belting to sweetly and affectionately introduce Oberst and The Felice Brothers to the stage. Oberst allows his Midwestern background to guide his easy-listening music style as well as his stage presence. He cooly entered the scene with a sheepish wave, head down, in the midst of cheers meant specifically for him. His hair took up prime real estate of his face — it was significantly longer than the recent clean-cut look he’s been rocking for the past few years. The new ‘do reminded us of his days in the band Bright Eyes when he perpetually had one eye covered with his dark locks. He wore a beige checkered button-down that vaguely resembled the fabric of a corner booth in a small-town diner, which was in stark contrast to his cherry red guitar that hung low on his torso. “Hey, y’all,” Oberst said teasingly, holding his vowels longer than what’s typical, even for Southerners. There was no real beating around the bush, and the band sprung into action. To match Oberst’s throwback vibes, it started the show with Bright Eyes song “Make War.” He raised his voice on the words “Return, return to the person that you were. And I will do the same,” further bringing attention to the visible resurfacing of his early 2000s energy. However, Oberst didn’t let us forget his years of experience performing. Within the first song, he kept pointing to the amp in front of him, looking to someone on stage right. His sound guy came out as discreetly as possible, and with total grace, he managed to communicate through body language, eye movement and what can only be telepathic wavelengths of what was wrong — no lyrics or chords missed on Oberst’s part. In the second song, “Southern State,” (fitting, right? ), it was evident that whatever issue the crowd had not noticed had been resolved, lifting the singer’s mood ever so slightly. Time and time again throughout the night, Oberst awed the crowd with the intimacy he had between the band. In moments of melodic enthusiasm and guitar-riffing, Oberst would leap backward toward the drummer, finding ease and comfort to rock with the percussion, like it was his home. In other instances of testing out instrumental arrangement, he’d look to his bass player as if to say, “You got this?” and she would confirm with a smile and nod that she, indeed, totally had it. Regardless of seemingly aloof attitudes toward fame and fans found in most indie singer-songwriters, it was one of those shows where the bassline and drums overwrite the works of the audience’s own heartbeat. Conor Oberst, even after 20 years of playing on countless stages for crowds big and small, still finds his loyalties lying with his need for musical expression.